File system defines the way that data is stored on the disk. File system is created upon a process called formatting. Every new hard disk must usually be partitioned and formatted before being used in the system. Many other articles are dedicated to these processes. FAT16 (File Allocation Table) - Support from most operating systems (DOS, WIN95,WIN98, NT, 2000, OS/2). Maximum size of the partition can be only 4GB (Fdisk in Win95,98 and Dos supports only 2GB). Support of long file name by length of 255 characters. Required if you want dual-boot Windows NT with another OS (DOS, WIN95). FAT32 (File Allocation Table) - Not compatible with NT4 system. Fast file system designated for Windows 95 OSR2, 98 and 2000. 32bit structure. Using smaller size clusters, large saving size compared to FAT16. (Up to 2 TB). Maximum file size is 4GB. It is recommended for portable media used in different OS. HPFS (High Performance File System) - Older system used in IBM and Windows NT 3.51 operating systems. For installation of NT 4 it is necessary to convert file system to NTFS. It is not supported in NT 4. CDFS (Compact Disc File System) - Used for recording and reading the Compact Disc (CD). Some features are only available in some operating systems. Some other features that are dependent on NTFS will be introduced in forthcoming articles. The features are similar to those in Windows XP, but they include many new tools and properties. NTFS restricted permissions are applied on most folders and so there can appear problems with accessing them from the network or Windows XP, if not manually configured. NTFS system is required for installation. 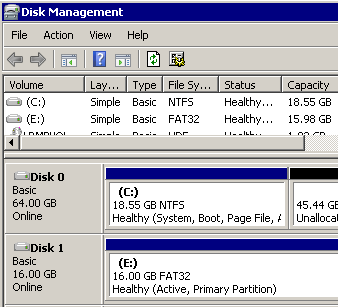 If you want to use the existing FAT32 partition for installation, you have to convert it to NTFS. As a new feature, the size of a disk partition can be changed without deleting or formatting it. NTFS is preferred. This system enables you to format the disk using FAT32 to the size of 32GB; if bigger, you will only be offered NTFS in the options. Support of all operating systems except an older one - HPFS. It is recommended to use the new version of NTFS files. For using at home possibility of FAT32 usage. For higher security NTFS is recommended because it enables to set up the security for particular files. For reading the disks from NTFS system from Windows 2000 you must have installed Service Pack 4 or later. For reading the files in NTFS system you have to install NTFS support for Windows 98 which you find on www.winternals.com page. Not possible to read FAT32 file system. Support of older FAT16. For reading NTFS possible to use NTFS File System Driver for DOS. How may it be with the file size on the disk with different file systems? Access to NTFS in case of disk breakdown. Transfer the disk to another computer where the OS Windows NT have been installed. Transfer the disk to a computer with Windows 98 where the support for NTFS has been installed. Use the diskette for DOS with NTFS driver. In 2006, Microsoft acquired the Winternals company (products for NTFS support and some other tools for administrators). How to identify used file system?